Podcast Summary:Branding your practice includes everything from the colors you use to represent your firm, to the clothes you war and the ways in which you do business. Photographer, Teresa Berg, talks about the use of color in your branding program. 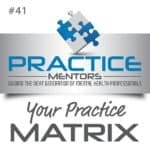 Podcast Summary:Your personal brand is what separates you and your practice from everyone else. Scott Markowitz knows a little bit about making branding work for you. Have a listen! Podcast Summary: Marketing your practice requires a solid online presence. Kathleen and Phillip talk with James Giroux about building your practice through your online hub, your website.